Could Mites on My Dog Be From the Lawn? All kinds of mites are present in the environment, even in the lawn. Two types cause dogs the most trouble, and both are in your grass. These mites also affect humans, but humans are often less likely to come into direct contact with them. Dogs enjoy a good lounge in the grass on a hot summer day, presenting the mites with the perfect opportunity for a host. Harvest mites, also called chiggers, are tiny red insects that attach themselves to the skin via puncturing mouthparts. They feed on skin cells they break down by injecting an enzyme into the bite area. They prefer dogs' bellies and groins, and the delicate skin between their toes, as these areas are easy to puncture. The mite's feeding stage is its larval stage. It feeds for days or weeks, causing irritation for this time until it enters adulthood and drops away continuing its lifecycle. The sarcoptic mange mite causes painful and disfiguring sarcoptic mange in dogs and humans. While this mite does not live and propagate in grassy lawns, it may be dropped there by other infected animals, such as other dogs, foxes, coyotes or cats. This mite burrows deep into the skin, feeding on cells and laying eggs as it goes. The eggs hatch and the cycle of misery continues for the infected dog. Mite symptoms are excessive scratching, rubbing and licking. There may range visible symptoms from red bumps or hot spots to extreme hair loss and weeping sores, depending on the severity of the infestation. Avoid touching the affected areas without protective rubber gloves and keep the dog quarantined from family and other pets until the problem is resolved. Keeping an infected dog off the lawn minimizes the spread of additional mites. 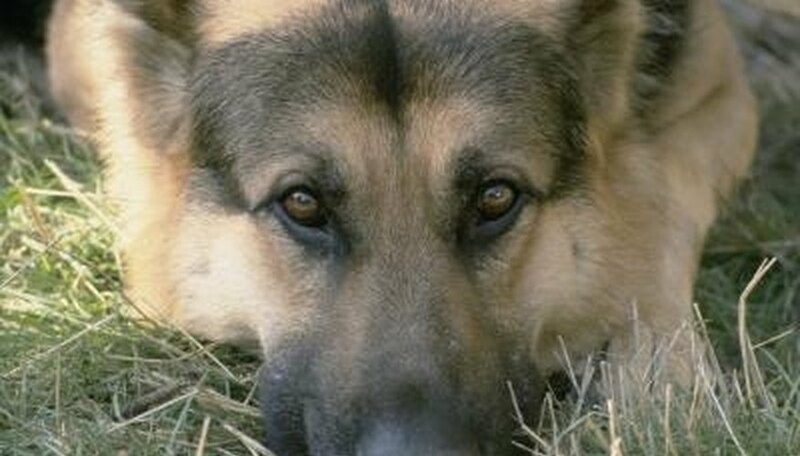 Get veterinary treatment for the dog to alleviate its suffering. Mites are uncomfortable, at best. Treat mange mites with ivermectin, while harvest mites are more easily treated with over-the-counter medicines. Some ear mite medications are effective in some cases of harvest mites. Keeping your lawn short and restricting dogs to early morning and evening playtimes reduces the instance of mite infestations. Spraying approved miticides is effective in some cases. Is Blue Fescue Grass Poisonous to Cats?